I think that this is one of my favourite ever makes! Unusually for me, this one was extremely spontaneous. No real planning, no fabric purchasing, just a vague idea that someday I wanted to make a button down denim skirt. I've wanted (and still do want!) a blue denim button down skirt for absolutely ages. I contemplated buying a pattern, for example the Pauline Alice Rosari Skirt, but what I really wanted was a skirt with panels. Plus, patterns are expensive, and when this is combined with fabric and notions, the price really starts to build up. So I decided to have a go at drafting my own pattern to make my skirt. I looked at a few YouTube videos, and decided to use this one to help draft my pattern. I didn't actually end up relying on it much though, and made it up a bit as I went along! I wasn't sure if it would turn out well, so I decided to use an old pair of my Dad's jeans for the fabric. Here is what is left of the jeans after I destroyed them! Really annoyingly, I forgot to take a photo of them at the start, but it isn't too hard to picture a pair of men's black jeans. I literally used every single piece of fabric. This is my second re-fashion (my last one was also using an old garment that belonged to my Dad, you can see the finished top here). I love the freedom of using an old garment as your fabric. Had I been using expensive denim that I'd bought, I probably wouldn't have drafted the skirt, worrying that it would go wrong and that I would waste the fabric. 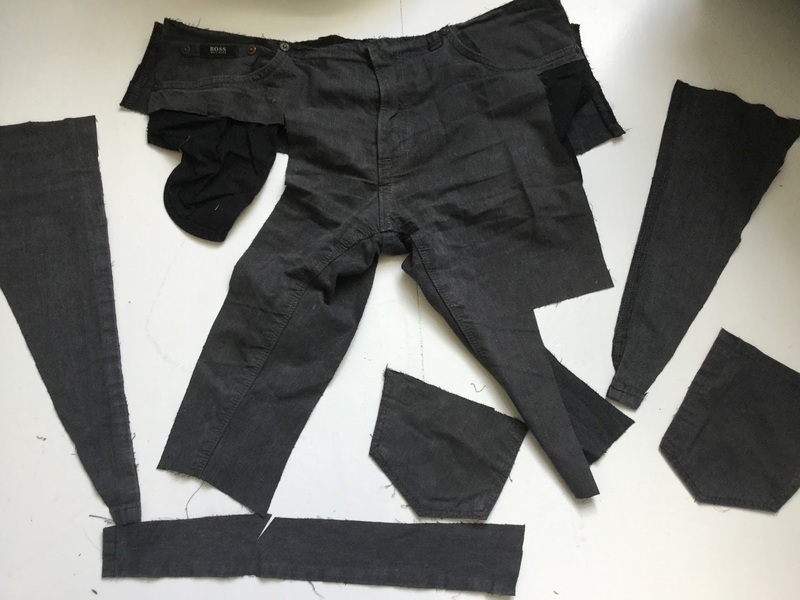 As it was, I wasn't at all worried to make mistakes because at the end of the day, I was using an old pair of jeans that otherwise would never be used. The main problem with using an old item of clothing as fabric is that it will probably be worn out. The fabric on the front of the jeans was very faded, so I decided to make the wrong side of the fabric the right side. This included un-picking and then re-sewing mock-felled seams, but it was definitely worth it as the fabric looks lovely and new. Also, the jeans weren't quite wide enough, so I did have to add an extra strip of fabric for the button band, but it isn't a problem. The only other problem I faced in terms of using old fabric was the fact that there was a hole in the fabric. 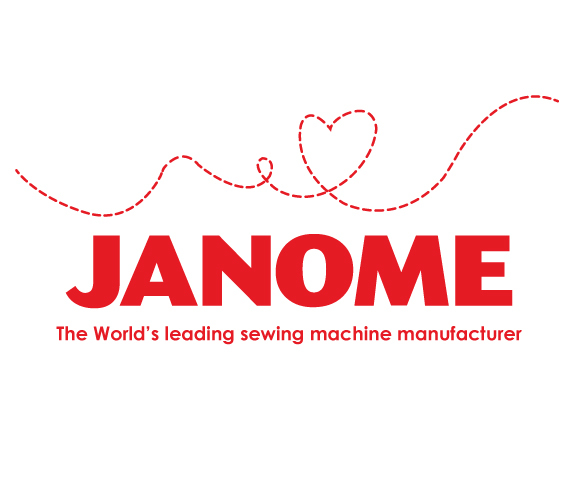 This was solved by sewing a strip of fabric which consisted of two fabrics sewn together on top of the hole. The lovely strip of fabric is for me the wow factor of this skirt. It was my Mum's idea, and at first I wasn't sure. The pink and green floral fabric is one of our absolute favourites, but although I thought it would look gorgeous, I was worried it would be too bright. However, paired with a slightly wider strip of grey spotty fabric, I think it looks perfect! I love this detail so much, I'm so pleased that I decided to give it a go. Furthermore, as mentioned above it covers the small hole, which is an added bonus. I used the same buttons that I used on my Rosa Shirt - I absolutely love these brass jeans buttons, I think that they add a lovely extra touch. 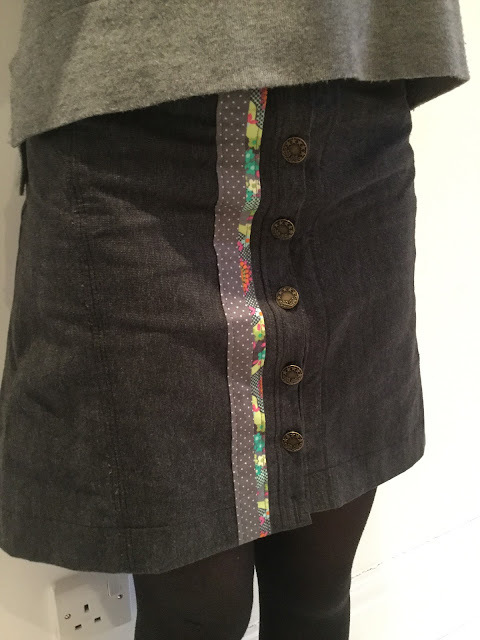 As well as the appliquéd fabric and the buttons, there are a lot of nice details on this skirt such as the mock felled seams (down the centre back and two at the front) and the waistband. I saved the waistband from the original jeans, and then unpicked it and sewed it back on. I love the look it. I also kept the belt loops, and although I haven't worn this skirt with a belt yet, it's good to know that they are there and I also like the touch they add. So overall, this is absolutely the skirt of dreams! It started off as a bit of a tester project, but ended up as something that I know I'll want to wear again and again. And to think that it started off as a worn out old pair of jeans! 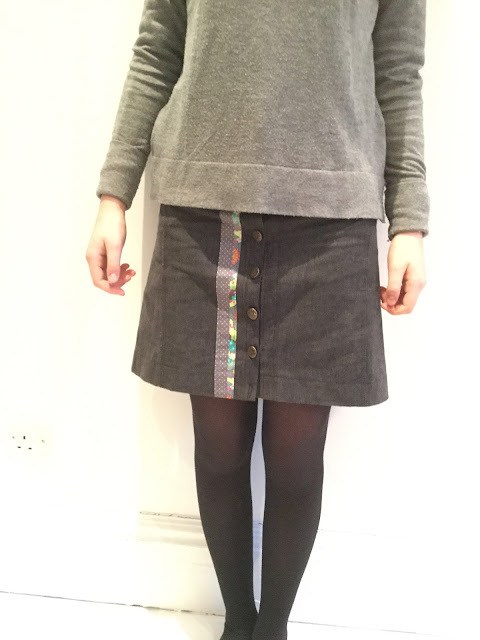 What a great job you have done drafting this fun skirt - congratulations! I too love the colorful strip of fabric as it adds some interest. Lovely! Well done! This looks fabulous and I love the strip of colorful fabric. I have found that when I have had to improvise, real creativity seems to come out. Refashioning is so much fun. Have you ever looked at the blog called Refashionista? You might enjoy taking a look there. 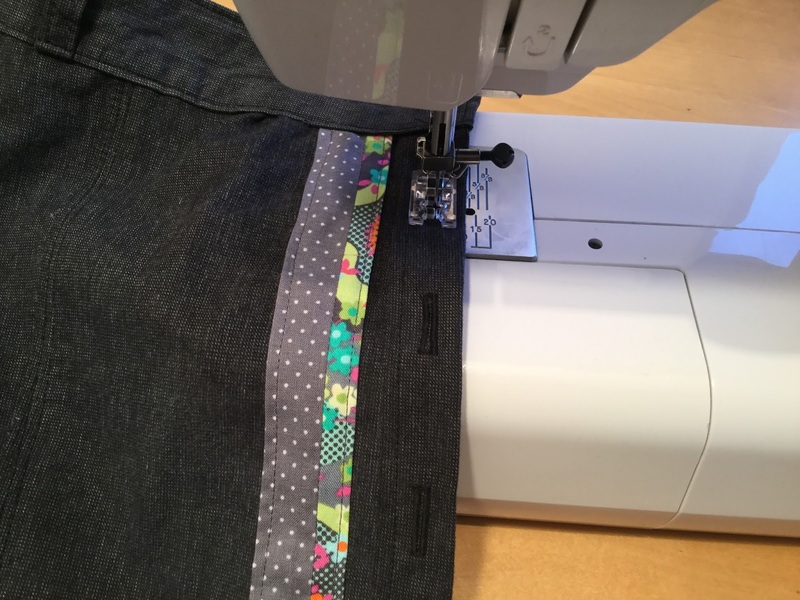 A few times I have also taken jeans and cut them off just below the zipper and attached a pretty cotton to make a skirt for my girls. Anyway, what a great way to refashion your Dad's jeans!! Another great make. I love the strip of contrast, I think it made the skirt uniquely yours. that is gorgeous and love that fabric strip - genius.... great use from an old pair of jeans! I think you did a super job on your refashion! Its a keeper. Well Done. It is good to go off piste sometimes. What a great refashion. Your skirt turned out great. I'm yet to do a refashioning project.